If you watch the gadget world it’s easy to understand that at least one brand new Android smartphone is released almost every day. Now there is no question that Sony is one of the world’s best Android Smartphone manufacturers, Now when we look at the Smartwatches, it is a gadget that haven’t really taken off yet, but more and more people are getting interested in the gadget after the Pebble smartwatch smashing its huge target and with Samsung bringing out its own version as the Samsung Galaxy Gear. Sony’s SmartWatch 2, is actually Sony’s third smartwatch, it is a beautiful water-resistant Android watch that act as a second screen for any Android 4.0 smartphone. You can read texts as well as check emails and even social media without even taking your Android smartphone out of your pocket which is a huge advantage over the Samsung Galaxy Gear. The Sony SmartWatch 2 is made using aluminium painted black and shows off the machined edge silver underneath the gadget. It’s a beautiful, good-looking, and uses the trademark design round power button used on a wide range of Xperia phones and tablets. The only physical button available on the smartwatch is that round button all other controls are based on touch screen, it comes packed with the usual Android touch buttons like back, home and menu at the lower end of the watch. The high quality 1.6-inch LCD screen is super bright so it can be viewed even on the sunniest day and the size is large enough to use comfortably. The resolution of the Smartwatch is only 220 x 176 pixels which on the 1.6-inch screen rounds up to around 176 PPI. The resolution is not so impressive by any means, but is more than legible enough, and the pixels are clearly visible. The Smartwatch comes with a light plastic strap with a choice of four colors and you can upgrade it to a heavier metal strap which is available to purchase separately. The Sony Smartwatch 2 comes packed with NFC for easy pairing; Bluetooth 3 and microUSB for easy charging and data transfer are included. The microUSB port is covered with a flap to ensure that the Smartwatch 2 retains the IP 57 water-resistant rating. The gentle vibrations will make sure you are aware of all the new notifications which you could check in a second. The ability to answer and reject calls is hugely remarkable will be applauded by many, then the ability to use the watch as a viewfinder to take photos when paired with a smartphone is also a great success over its predecessors. Although the smartwatch lacks a mic or a speaker on board so there is no chance to talk to your wrist. But it may be taken as a good sign since the Sony Smartwatch2 can easily last for up to four days under normal usage conditions if it’s kept powered on 24 hours a day. That’s a lot longer than most competitors, except for the Pebble Smartwatch that uses a different technology for the screen. According to the present rumors there will be many Android apps available for the Sony Smartwatch2 at launch and much more is said to follow. The Sony SmartWatch 2 is a good looking and stylish smartphone accessory. But altogether I strongly miss a killer feature that should make it unique and compelling over the Pebble and Samsung Galaxy Gear, Although the 4 day battery life and IP 57 water resistance will be highly welcomed by the outdoorsy type people who enjoy the nature. Other than that it is a gadget you need to try first before you make a complete comment about its power and usability. 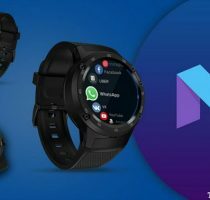 Sony released the Smartwatch in the UK markets yesterday now we should wait for its official release in rest of the countries which should be pretty soon to get a clear picture about how much has Sony improved and adapted over the years. How do you rate the Sony Smartwatch2? Do you think it got the Killer feature to get loyal followers? Throw in your suggestions and comments and let’s dissect this more.